A: We don’t quite have the bandwidth to tackle this just yet – we still need to improve Expo on iOS and Android, but I hope we can there soon. Web prob won’t be as good as the iOS and Android targets, at least not until some big progress is made by browser vendors. But lots of developers need to make a mobile site too, and react-native-web is an excellent way to do that, so using your native mobile app as a place to start, where you get a mostly functional web app for free is exciting and sounds awesome to me. Hope to get a chance to work on this soon but no ETA or concrete plans yet! re: motivation for working on Expo. After I left my last job, I had a bunch of ideas about what I wanted to work on, and they all basically involved building mobile apps. One example of an app I wanted to play around with was, in my head, called “Chuber”. 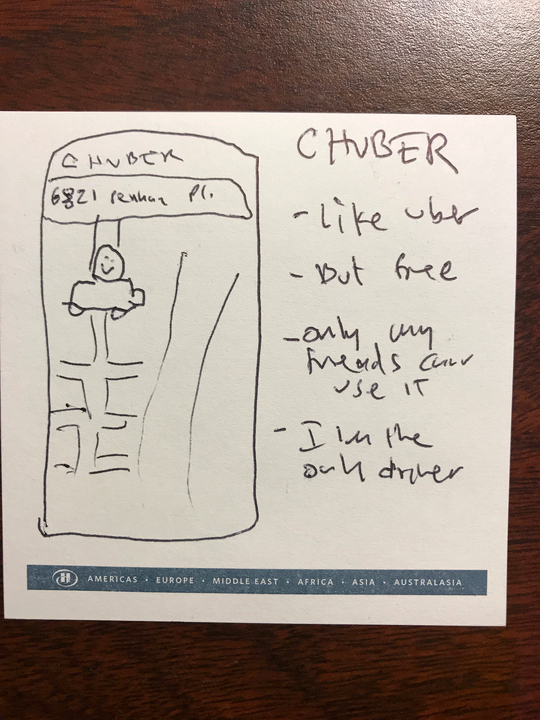 The idea is that its an app like Uber, except free, only my friends are allowed to use it, and I’m the only driver on it. So if I had free time and my car, it would be a good win-win way to catch up with people, instead of scheduling drinks or coffee, etc., I could give someone a ride to the airport. But its also a silly idea. And so I would love to be able to spend a weekend building it and try it out and see if its a silly idea thats fun and cool, or at least learn if its just silly. But when I sat down to build it, I realized that making it work on iOS and Android would probably take me months using Obj-C/Swift and Java, and it just wasn’t worth it. A: That’s a great question. I think that this process of things shaking out is a natural one. Navigation within apps is one of those things that seems simple but actually has lots of different ways you can appraoch it that have a lot of depth and complexity to them. I think basically the approaches have narrowed a little bit to native navigation (though maybe there are multiple native navigation solutions, I haven’t been following it as closely) and react-navigation. React-navigation is still a work in progress but its getting better and most of the people who do navigation in JS are getting behind it. Skevy and Dave from the Expo team have been working, along with other contributors, to make it better, including work to make it feel as close to native as possible for those who want that (getting the animation curves right, and the masking right, etc. To match iOS, etc. Etc.) I think that that getting better over time is probably where things shake out? A: I don’t have a good answer for that off the top of my head. I think using Sentry is your best bet. We use that for getting stacktraces around errors etc and I think they also do logging. A: Your question makes me think of something FB said at the keynote when React Native was announced. “Learn once, write anywhere”. That’s how I see app building in general going – where you learn the React paradigm and then can write it on web or in Electron using kinda web or in react-native, etc. But the tension here is that you don’t want to abstract too much for targets that have meaningful differences. For example, mobile Safari and Chrome mobile let you sort of “write once, run anywhere” with desktop websites. They do work, but there are tons of ways that using a website made for desktop web browsers is janky and unpleasant when on a mobile device. I think that you should write once, run anwywhere for iOS and Android because they are both just black rectangles with touch screens and you don’t want different apps, but you probably will want to be able to write platform specific code when one adds new peripherals or things like ARKit before the other. And if you are dealing with desktop vs mobile, you’ll probably want some meaningful differences as well. That said, some people have made pretty good responsive websites that work decently well – and change themselves around – in desktop vs mobile places, so maybe we’ll see that. I also think there’s an interesting possibility of react-native targeting desktop more and platforms broadly, like @necolas talked about it in his recent talk. Some people have already made stuff for Mac and Apple TV. A: Re: building a visual UI building tool on top of Expo to make building apps easier. Yes! We have been talking about that. It’s yet another thing that I reaaaallly want to do, but we need to make Expo a little more solid and feature complete before we start building stuff on top of it. I really liked Hypercard when I was a kid and there’s really good things about how you can visually create a UI and then add in programming as necessary. A: I’m excited about wasm. My hope is that it makes running interpreted languages much faster, and opens up platforms like RN and web so that people can write other languages besides just JS and get really great performance. There are a lot of people who’d love to write Python and be able to make React Native apps that way. I don’t know whether people will end up writing the same language on the server and the client in a post-wasm world. They are already moving that way to some extent with JS and the rising popularity of Node. If that happens, will developers coalesce around one thing? Maybe, could be JS or Python or Rust or Go or Reason or Elm. I don’t know for sure yet and don’t have a fully formed view on this. A: I haven’t seen react-native-interactable yet. I’ll Google it after this session and look into it. A: Yes. I’m sorry that you have to go to all that trouble. Why do you need to run exp build so often? We are just starting work on supporting different release channels now. This is an issue that affects lots of people, not just you, so we’re thinking about it and trying to give everyone a good solution. Feel free to leave comments on Canny or post in our forums describing what your needs are and any thoughts you have about possible solutions. That will help us build the right thing. A: Sounds really cool. I was at PennApps – a big college Hackathon – last weekend. And lots of students were building things that would have been able to use something like that. I do think that there are many people building different solutions to this, so its hard to say whether people will flock en masse to yours without seeing it live. Neglexis: Yeah of course. Currently only works with OrientDB though, but the bridge to other DB’s should be easy. We’re also looking to open-sourcing it, but it’ll be our first open-source projects, so any tips on a first open-source project would be awesome! A: 15 now! have added a bunch, trying to build out all the features people are asking for. We’ll probably mostly stay close to this size for a while and go heads down until we can nail everything that our users are telling us they need. A: I think everyone has a college degree except for Perry who has a high school degree. A couple of people might have masters degrees but I’m not sure. It’s not very important to me whether people have degrees or not, as long as they know their stuff. But I also think schools are great places in that they are places where people who want to learn congregate. A: We think if we can help developers make money, there will be ways for us to make money along side them. Sort of the way that youtube and twitch do with video creators and streamers. So for now, we’re just trying to get expo good enough that almost everyone uses it to build their mobile apps. I don’t think that, in general, people will pay for developer tools (though they do often pay for developer services), and we thought it was really important to make expo open source so that people could have confidence in using it. A: Our north star at Expo is that we serve people who want to make awesome stuff, and our job is to help them do that. Everything else flows from there. That’s our #1 value and the first thing I would tell anyone. Though I would probably have lots more to say after that too. A: We are happy to have people of any age on the team as long as they are great contributors and I don’t know off the top of my head how old everyone is actually. But I think I’m the oldest; I’m 36. I think the youngest person is 23 and we had an intern who was 19 but he went back to school. There are a bunch of people who are ~27. A: I don’t expect Fiber to break much because I know the team working on it has been very methodical in testing all kinds of cases with it. Http://isfiberreadyyet.com/ I think the performance of certain things will improve a lot, but for lots of other things, you won’t notice at all because the things that Fiber improves aren’t the bottleneck in many cases. For example, going back and forth over the async bridge is somewhat expensive/slow/unpredictable and Fiber won’t fix that. I’m thankful and excited that a big talented team at Facebook puts so much into making React and React Native better and better in ways that would be hard for the OSS community or Expo to tackle alone. A: When I wanted to ramp up on this, I had someone walk me through adding a screen brightness API because it was pretty small and straightforward and could mostly just follow along from the code in an open source module on Github. Detaching is basically giving you a personal build so that you can write your own native code while still continuing to use RN JS and the Expo SDK/API. A: Yes! multimedia in general, and esp. Video is a big focus for us. We’re rolling out more video and audio stuff over the next few months. We just rolled out the new camera stuff and are excited about the additional stuff we have planned. A: My own view aligns a lot with Nicolas Gallagher’s in the talk that he gave at React Rally that I linked to above. I think React Native embodies the cleanest implementation of React and is free from the cruft of the web being around for 20 years that you get when you use React-DOM. The way I build web stuff now is that I code it very much like I would code React Native – using JS obejcts for style, using flexbox, etc. I think if you learn React DOM or React Native, you’ll find its quite easy to learn the other. I would either start with React Native and Expo – and then you could use react-native-web to make a website if you wanted one. Or start with NextJS from Zeit if you wanted to just make a website. It’s nifty. The most important thing about learning is just doing stuff though! If you make a couple projects you’ll be good at both in no time. A: Yep. The FileSystem module is something we’ll keep working on. We just released our first version of it, but will continue to improve it. A: I’m not aware of any specific requests for it but I’d have to check on Canny and in our forums to be sure. We’re not against supporting it, but probaly would only prioritize it in response to users asking for it. If you need it and we don’t support it, ejecting/detaching is probably the right way to go for now. A: I think someone needs to make a project that basically combines create-react-app and create-react-native-app. If you see my answer above, we’d like to do this soon, but maybe someone else will do it first. All the pieces are there; someone needs to just put them together to make it easy. There is also a bunch of hard detail work that needs to be done to make it work well. For example, when we look at Expo apps, tons of people use features like native maps and video players and camera views, etc. How do those look in a web context? Some can just work if they are polyfilled, some will degrade, some will have to be left out. Someone needs to artfully implement a lot of polyfills. I think the approach Necolas outlines where you use React Native as the canonical starting point since its cleaner, and then use that to target web, is the right way to go. Designed in Sketch. Coded in Atom. Built using Gatsby.js. Hosted on Netlify.